The effect of warming on macroalgae-consumer-parasite interactions. Project lead: Martin Wahl. 01 April – 30 October 2019. The BENTHOCOSMS are open for user approve to AQUACOSM Transnational Access to participate in running experiment from April through October. Rationale: The fate of Baltic macroalgal habitats in response to warming is determined by the shifts in specific performance of an algal species, shifting interactions among competing macroalgae or between macroalgae and their consumers, and finally shifting impact of parasites on consumers and epiphytes on macroalgae. Existing interaction webs may further be modified by the arrival or spread of invasive species. In this first of a series of experiments (2019, 2010, 2021) we will concentrate on competitiveness and palatability shifts of macroalgae. Research Topic: We will examine the impact of warming on algal performance and their palatability for mesograzers. If manpower and time allows we will compare the responses between invasive and native representatives of the two functional groups, and changes in parasitism. Approach: To this end the 12 KOB are subjected two levels of warming (ambient vs warmed) relative to the naturally fluctuating temperature of Kiel fjord. In each tank we will introduce an assortment of green, brown, red macroalgae and various mesograzer populations (e.g. isopods, gammarids, snails). The treatment consists of 2 levels of warming (0, 3°C above fjord temperature). Response variables assessed will be, inter alia, individual performance (e.g. growth, reproduction), shifts in competitive and trophic interactions, and – optionally – parasite/epiphyte load and parasite/epiphyte impacts. Additionally, own ideas of the visiting researchers may be incorporated. Any expertise of users is welcome. 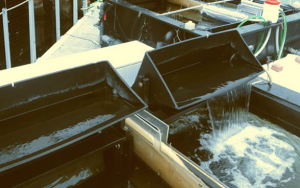 We specifically encourage experts in stress physiology of algae and invertebrates to join the experiment. We welcome the input of visiting researchers for the customization and optimization of the experimental design. Application deadline is Nov 14, 2018. A total of 135 person-days is allocated to external users through AQUACOSM Transnational Access provision in 2019. An average of 3 persons for 45 days is envisaged each year. We can accommodate up to 5 external users at a time. Impact of sporadic upwelling on structure and functioning of benthic communities. Project lead: Martin Wahl. 01 April – 30 October 2018. Rationale: Wind and upwelling regimes will shift in the course of Global Change. In addition, in the wake of ongoing warming (intensifying stratification) and eutrophication the difference between surface water and upwelled bottom water will become more extreme with regard to temperature, nutrients, salinity, pH and oxygen. Research Topic: We will examine the impact of sporadic upwelling on community structure, biotic interactions and ecosystem functioning. Approach: To this end the 12 KOB are complemented with 12 pelagic mesocosms floating alongside the KOB and having a volume of ca 3 m³ each. Communities included will be a natural inoculum of spring plankton, sediment cores and a macrophyte community composed (initially) of Fucus vesiculosus, Fucus serratus and co-occurring species (snails, gammarids, isopods, mussels etc.) in natural proportions. 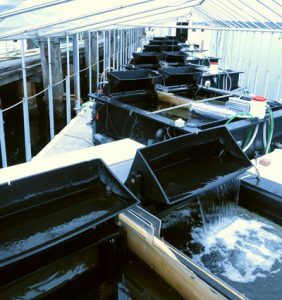 The experimental unit composed of interconnected sediment community, macroalgal community and plankton community will be replicated six-fold. The treatment consists of one triggered upwelling of bottom water per month via an existing deep water pipe of 2-3 days duration in half of the tanks. This bottom water will be similar to surface water in spring, have increased nutrients and salinity and lower temperature in summer and, additionally, reduced oxygen and pH in autumn. Response variables assessed will be, inter alia, individual performance (e.g. growth reproduction), shifts in competitive and trophic interactions, changes in community composition and shifts in community services. Any expertise of users is welcome. We specifically encourage experts in stress physiology of algae, sea grass, and invertebrates to join the experiment. We welcome the input of visiting researchers for the customization and optimization of the experimental design. Application deadline is Oct 6, 2017. A total of 135 person-days is allocated to external users through AQUACOSM Transnational Access provision in 2018. An average of 3 persons for 45 days is envisaged each year. We can accommodate up to 5 external users at a time. The GEOMAR Kiel-Outdoor-Benthocosms (KOB) are designed to simulate future underwater conditions expected under climate change (Fig. 6.7.1). It has been successfully used since 2012. The facility consists of 6 experimental units holding 3000 l each, which can be sub-divided into 12 autonomous units of 1400 l. Covers translucent to all solar wave lengths can be used if headspace conditions need to be controlled. Water movement and turbulence is controlled by water throughflow, internal circulation and wave generators to produce a wide range of hydrodynamic conditions. Natural upwelling events are simulated with a deep water hose supplying water from below the thermocline. Possible simulations include abrupt changes in salinity, O2, pH, pCO2 and nutrients. The entire infrastructure, including a container with master computers, freezers and a workshop, is installed on a floating platform. A unique feature of KOB is that it can track the short-term fluctuations characterizing natural regimes of environmental factors, such as temperature, pCO2, O2 and nutrient concentrations. It is operated in flow- through mode to create in-situ conditions in real-time by adjusting the climate-change factors of interest to dynamic target values based on the experimentally desired deviation from a continuously recorded baseline in the field. Adjustments to the target values are fully automated by means of a sophisticated instrumentation and control (I&C) system that also records a range of environmental variables continuously. Novel software serves to mimic the exact regimes of temperature, pH, O2 and other environmental factors of a given year in the past or any deviations from those conditions. A total of 405 person-days is allocated to external users through AQUACOSM Transnational Access provision in years 2-4. An average of 3 persons for 45 days is envisaged each year. 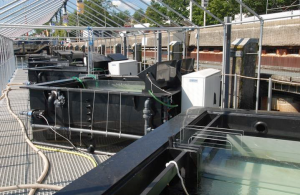 Users will have access to the mesocosms, laboratories and instrumentation described above. Research activities under AQUACOSM will preferably be integrated into larger multi-disciplinary projects, but could also run in parallel or be intercalated between other KOB experiments. Projects planned for 2017 – 2019 include the combined effects of warming and sporadic hypoxic upwelling, comparative stress ecology in the Baltic and Mediterranean, impact of bioinvasions, emerging marine diseases.